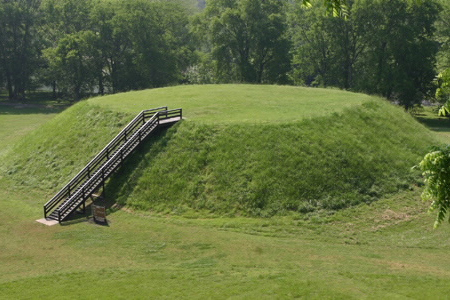 None of the prehistoric races that have inhabited North America have caused more interest and speculation than the Mound Builders. They possessed a highly scientific knowledge, for they perfectly understood the great Cosmic Sciences which today are just dawning on our scientific world. The Cosmic Sciences include the origin and workings of the Four Great Primary Forces, the parents of all forces. The Mound Builders and their Science came from Mu via Mexico. Man first appeared on Mu. One of the names given to Mu was the Tree of Life. In this legend the man and the tree are combined in one. To be more specific, Mu was the Tree of Life and Man was its fruit. This corroborated where the Sioux legend tells of a great serpent biting off the trees at their roots. A serpent was always the symbol for the waters and when Mu was destroyed she was swallowed by the waters. Biting, in the Sioux legend, is a correct word to use symbolically, for Mu was certainly bitten off from the rest of the land above water. “From these have sprung all the people that now inhabit the earth” clearly shows that this refers to the migrated children of Mu and is confirmed by the saying, “They wandered off” for they had left the land of their birth where they grew up, to go to other lands where they might find living easier. The Mound Builders were living in America after Atlantis went down about 11,500 years ago. Geographically they occupied what may be termed the Mississippi Watershed. This area before the sinking of Atlantis was a shallow inland sea extending north from the Gulf of Mexico. The sinking of Atlantis in the Atlantic Ocean formed an immense hole in the Atlantic. To fill this in and level off the waters the surrounding waters were drawn in. This drew off the waters from various shallow inland seas, made them either dry habitable lands, or swamps. It also extended the coast lines. During the process of the readjustment of the waters the Mississippi Valley was drained. The ancient Mound Builders as a people are gone, but they did leave descendants in America. They have descendents still among some of the tribes of the southwestern states. Both knew how the Forces of the Sun are generated and carried throughout the Solar System. Both knew the Sun has a hard crust and a soft center. Both knew that the Sun is being revolved by her Superior Sun from west to east. Both knew the revolving hard crust carries around the soft center in the same direction, but not at the same velocity, thus forming a frictional line, a magnet. This is shown by the soft material in the center being curved. This Mu-ab-ite Science refers to the Four Great Primary Forces by the central soft material being divided into four arms forming a cross, the first and original symbols of the Four Great Forces. Hence the Cosmic Sciences have not been entirely lost. Scraps of them are still known in the Orient and among the Polynesians. The cross symbolizes the Sun as the Celestial Orb with a white cross in the center surmounted with a red cross (tau). 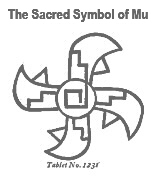 The white open cross read U luumil, which translated is the Country of, the Land of, the Empire of – and being within the Sun, reads – the Empire of the Sun, Mu. The serpent mounds were no doubt symbolical. Serpents of various patterns and designs have always, from the beginning of religion, played an important part in religious ceremonies, not among one particular race but among all ancient people from the time symbols were first used. 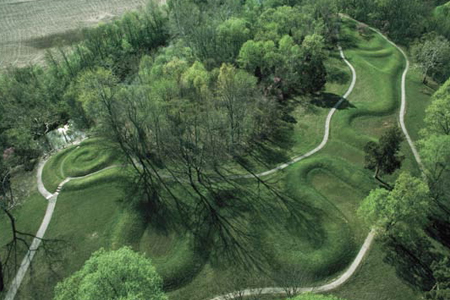 One of the most important of the American Serpent Mounds is situated at Brush Creek near Peebles, Ohio. This Serpent Mound could have been symbolically used as the Seven Great Commands of Creation, the Waters, or the destruction of Mu, the Motherland. Some of the serpent mounds have altars upon them, with the possibility that all had them at some time. As Mu went down it was cast into “a fiery abyss,” fires of the underneath. It became a custom among all surviving peoples thereafter at various times and occasions to commemorate her destruction by fire. Fire is shown to have been used in commemorative services by the Mayas and Quiches who had their fiery house, and the Egyptians who used a fiery tank, and others who used burnt sacrifices of some description. In England near Stonehenge there is a Serpent Mound said to be an exact duplication of the American at Peebles, Ohio. Thus, we find in England a specialized symbol of the same as used by the Mound Builders of America and in both cases the same meaning and conception is conveyed. Yet another question for the reader is: By what route did the Mound Builders get into England?